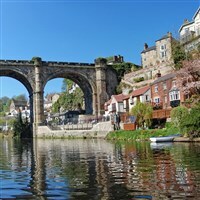 Situated on the River Nidd, Knaresborough is a delightful town with lot to do and see. Well known for its associations with Old Mother Shipton, its castle located overlooking the town and Bebra Gardens, this town is worth a visit. Dont miss the quaint and interesting market square and the viaduct over the river, it offers some awe inspiring views.